KGCCI Sec.Gen. 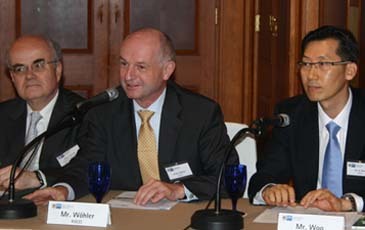 Jürgen Wöhler (center) speaks during German World 2008 press conference held in a Seoul hotel on May 28, 2008. To his right is Mr. Woo Ho-Je, deputy secretary of KGCCI, and to his left is Mr. Klaus Herzog, the counselor for scientific, economic and legal affairs of the German Embassy in Seoul. The Korean-German Chamber of Industry and Commerce (KGCCI) hosts "German World 2008" from May 29 — June 1, 2008 at the Indian Hall in the COEX Exhibition Center in Samseong-dong, Gangnam-gu, Seoul. Since 1999, the bi-annual event has featured products, services, education, science, and culture of German companies. But this year's event will only feature the most popular companies such as BMW, Volkswagen, TRUMPF, Audi, BASF, Siemens, Mercedes Benz, Merck, and Bayer. The fact that the German World 2008 will take place in May appears to be a good occasion for KGCCI to go beyond persisting images of German culture and to explore different national traditions by introducing to Korea another time-honored German festival, the "Maifest" - an new food concept. Instead of offering a common restaurant area at the fair, KGCCI will surprise you with a new style of dining, creating an ambience that will make you believe you are attending a traditional German Maifest with its joy of having survived the icy winter days and of starting the grape-growing season. The Westin Chosun Hotel will prepare traditional German delicacies. Of course you will not have to miss out on German beer either, and you will certainly be able to order the famous German "Weisswurst," but this time you will dine in an different atmosphere of spring colors rather than the traditional Bavarian blue and white. All your senses will be tickled when you experience your German World lunch break. The festival includes performances of traditional German dancing and classical music. 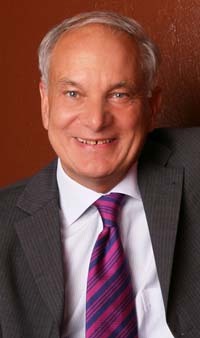 KGCCI Secretary General Jürgen Wöhler announced that all profits of the exhibition will be donated to the reconstruction of the Namdaemun (Sunraemun) Gate. After showcasing in Seoul, "German World 2008" will travel to Japan, Thailand, Singapore, and China. It gives me great pleasure to welcome you to the opening of the "German World." This exhibition displays sophisticated products and services characteristic of Germany's cutting-the-edge technologies and lifestyle today. I am grateful that Vice Minister Kwon could attend the opening ceremony. My special thanks to the German-Korean Chamber of Commerce and Industry, especially to Chairman Huh Young-sup and Secretary-General Jürgen Wöhler. Ladies and Gentlemen, Germany and Korea in 2007 witnessed another year of booming bilateral trade. Our economies have the potential to build up even stronger partnerships on the global markets. Germany has entered a period of renewed and sustainable economic growth. It still is the world's largest exporter of goods and its competitiveness is clearly on the rise. The reform agenda of the grand coalition government under the leadership of Chancellor Merkel has become a success story. Germany's lifestyle products, its attractiveness as a tourist destination and its advances in science and technology are perceived in Korea with growing interest. Let me also mention the significant European dimension of our relationship. The EU is Korea's second largest trading partner. We are negotiating a free trade agreement and we share the values and commitments of highly developed democratic societies. These are good reasons to work for a lively and substantive European-Korean future. Let us not forget that we are living on one continent and let us hope that the dream about a motorway and train connection running from Seoul to Berlin and Paris will come true one day. Ladies and Gentlemen, Germany and Korea can play an important role to advance understanding between Europe and East Asia. To achieve more, our governments, our research communities and our companies need to adjust and refine strategies. We have to know more about what is going on in our countries. And we can do a lot together. This is a strong reason to have the German World here in Seoul. In April 2009 Korea will be the major partner country at Germany's renowned Hannover Fair, one of the largest industry exhibitions in the world. It is very encouraging to see that German and Korean companies are engaging more and more in the joint development of future technologies. Let me mention as one example the renewable energy sector. Tide power, solar power and wind power offer huge markets when we pool our resources and research efforts. We will have to attach growing importance to cope with climate change through the opportunities of new environmentally friendly products and services. Ladies and Gentlemen, our relationship began 125 years ago with the signing of a treaty of friendship and trade. It was a fruitful beginning enriched by our close cooperation over the last 50 years. Let us work for an even brighter future! "EU: Role Model for World in Collaboration"
Ted Gim serves as staff reporter of The Seoul Times. He studied tourism management at a S. Korean university. He spent three years in England and Ireland, studying and living there. He studied tourism at a English college for two years. He covers tourism industry as well as diplomatic community in Seoul.